A journal - written and visual - of my nail polishes. I had hoped to pop this one up in January, but here it is now, Black Dahlia Lacquer's Before The Ball Drops. 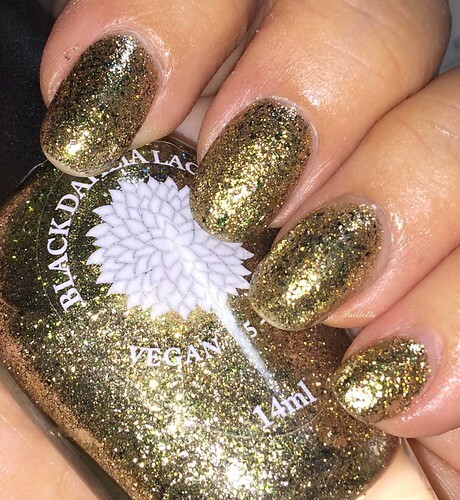 Unlike the image on the website, this is a bright gold with a fair amount of green flakies. Very pretty and super glam. This is three coats, no top coat. 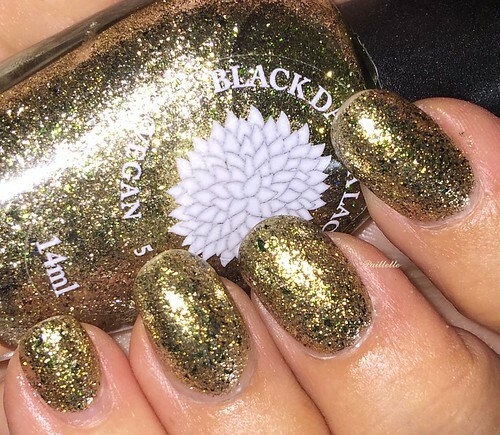 It is a beautiful polish, and perhaps the latest one at Black Dahlia Lacquer is a newer version. In any event, no complaints. Beautiful coverage and a lot of pow. Thanks for reading my little nail polish journal! Please email me at paillette.a.nail.journal@gmail.com to add your blog to my blogroll instead of posting your blog here! Did I mention I love comments? Keeping track of my polishes, how they wear, what they look like, and how I like them. I love feedback and comments, I am always thinking of ways to improve my application, photos, and blog. If you like what you see, please follow me on GFC or Bloglovin'! Polish all day, all night. Copyright 2009 - 2015 to Johanna aka Paillette. Background Image Copyrighted Johanna aka Paillette. Powered by Blogger.